Looking back to the previous cycles until this current one, I have come to learn and understand many new things and information. There will all be very useful to me, if not now then definitely later. Teamwork, deadlines, working under pressure, time management; these are just some new skills I have acquired but there are definitely more that weren’t mentioned here. Besides the newly developed abilities to operate Unity and write blog posts, I have also developed many no -technical skills during the time in this unit. Those were friendship, teamwork and better communication, as well as the ability to work under pressure and time constraint, looking out for and helping out team members. These skills have been built at the start and polished over time which changes how I look at newly made friends who might just be my group member in another unit. This leads to communication between each other, which helps me honed this skill even further. Now I can express my thoughts much easier and clearer. Many systems have been put in place to manage individual and team activities amongst the team members. One of them being meeting up in the workshop session. This is the time where everyone can group up and do team relate work face to face. Another strategy is to utilise a common platform of social media, which in this case is Facebook. Everything related to the team becomes a conversation there. Ideas and questions that weren’t present at the workshop meeting has been introduced. As well as helping other members who weren’t present at the previous workshop meeting catch up to the rest. By far, Facebook communication has been the most effective strategy used to manage the team. Each members has different level of responsibilities within the team. This also has to consider for their outside-of-team responsibilities such as other unit’s work and personal life responsibility. Although if that is to be ignored, the team did very well in my opinion in terms of fair work practices, tasks and activities completion, honesty between one another and overall participation of everyone in the team. Every cycles, the team would decide together of who is doing which activities of that particular cycle. The activities would be broken up equally amongst the team members to assure that it is fair for everyone and keeps the level of participation equal for all. Those activities then becomes the responsibility of the holder. I can agree that this section has become an individual responsibility because the marks belongs to those who decides to complete their assigned activities for the cycle. This leads to the honesty aspect of the members, which I can tell that we all possess such attribute. If we need help; we ask, if we can’t attend meeting; we provide legitimate reason, no matter how unreasonable it sounds. In the end, I’m glad I got Josh and Tom as my team members, as they hold those positive attributes towards one another and we got each other’s back all the way through cycle 1 to 3. This team wouldn’t be holding up without everyone’s contribution and positive attitude towards one common goal. Here is the raw word document playtest notes. Following the playtesting, the results revealed some very useful information and potential improvements on the game. Including the relation to the PX goals and bugs. The most common comments from the playtesters were “dark” even though that’s the main theme of the game, the playtesters didn’t know this beforehand. The playtest version of the game felt “incomplete” as some playtesters mentioned. The playtesters mentioned a lot about different enemy types to make the game more challenging as it already is moving around in the dark. Aside the general gameplay experience, common bugs such as getting stuck on objects and enemies have also been identified. A playtester who is considered “game development expert” noticed that the enemy’s aggro movement seems to be off as it moves in one constant direction. All of the playtesters find the general concept very creative with the light and dark elements. Majority of them were commenting about the clunky mechanic of battery recharging flash light. Considering that this is only the prototpye equivalent of the game, these comments were very helpful. They made the steps of improvements much more vivid and organised. Based on the feedback, the bugs that require attention the most are the enemy’s aggro distance and movement and damage application. General gameplay experience include more enemy types, more level’s quantity and creativity and better flash light battery system. 15 minutes playtest session suitable for game development experts (colleagues). 15 minutes playtest session suitable for target audience (“Bob”). Player assumes a role of a prisoner escaping a prison. The environment is near pitch black and the player is provided with a source of light such as glow stick, torch or flashlight. The goal of course is to escape from the prison using their given source of light to navigate around the area. Player has the ability to control their source of light as well as the option to attack the guards. They must find a key to exit the area as the exit door is locked. The light is source is limited as in glow stick has a limited quantity, torch and flashlight has their limited usage time. The goal of the game is for the player to reach the exit. In order to exit and achieve the goal, player must manoeuvre the near pitch black area using the provided source of light, avoiding or attacking guards is preference. The challenges of this game are the guards patrolling the area, locate the hidden key to open the exit and the limited vision the player has. The game took place in a prison where the player is a prisoner trying to escape that prison. As a player, I have to manoeuvre the dark environment in order to find the exit. Playing as a prisoner, I have to locate and take the key to unlock the exit and escape. Playing as a prisoner, I must use my glow stick or flashlight to illuminate the area around me so I can see what’s going on. Playing as a prisoner, I must avoid getting caught by the guards patrolling the area. As a player, I must be conservative of my light source so that I don’t run out and make the game harder. Playing as a prisoner, I can use my fist to knock out the guards so that I can pass through. Playing as a prisoner, I can hide and avoid getting caught by the guards so that I can pass through. As a player, I must avoid the guards so that I don’t get caught and lose the game. Playing as a prisoner, I must throw around my glow sticks to see further ahead of me. Playing as a prisoner, I must recollect my thrown glow sticks to restock my resources. As a player, I must wait some time for the my flashlight battery to recharge so it can be used again. The target audience is Bob, who has an interest in indie games and also very versatile on considering what game is fun for him. He can play game up to 3 hours each session and his iPad is one of his gaming platform. Starcraft was one of his favourite game, the aspects of strategy, conservation and patience is similar to what our game has. Our prison escape game is considered an indie game, which will attract Bob into playing it on his iPad. Each stages in the game does not take very long to complete, considering his available playtime, he can explore the whole game within his time limit. While the game stages can be small, the game can still be very enjoyable as the time and method of completing one is entirely up to the player’s skill. Bob, who likes to play Starcraft which require strategy, conservation and patience, will also like to play our game as it contains those same aspects Starcraft has. He will like the overall mechanic of using the given light source strategically. 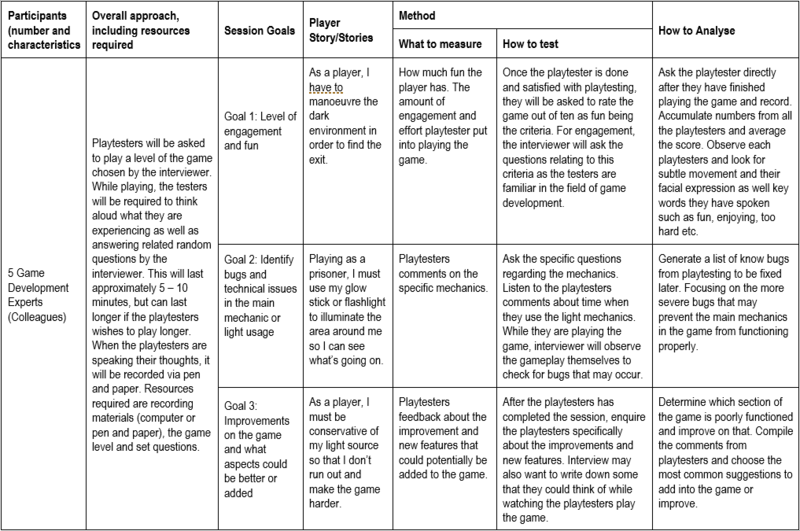 The playtesting was conducted on 5 different playtesters to produce the playtest report. Each one was asked to speak aloud their feeling and thoughts while playing the prototype. The prototype had a known issue that I still couldn’t find a solution to, the problem was informed to the playtesters before they start. The problem was that current score counters won’t reset when game is replayed without restarting first. While this is an issue, it didn’t affect the core mechanics in anyway. 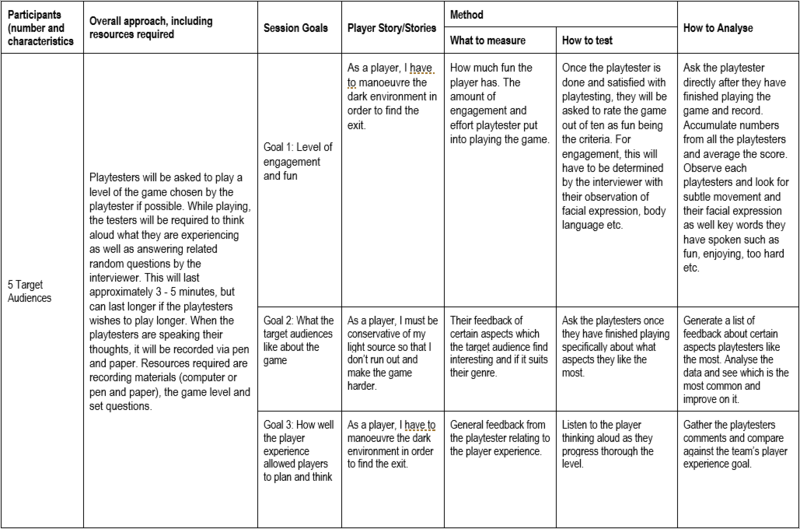 At the end of every playtest, playtesters were asked to give a fun score, scaling 1 – 10, 10 being the most enjoyable. The results were recorded electronically on Microsoft Word. Here is the link to the file. The most occurring comment was the hit box not being sized properly. However this problem can easily be solved by playtestings and improve on it each time. There were also many comments and recommendations regarding the selection of range weapons as well as the behaviour of the snakes. Unfortunately I cannot implement the weapon switching mechanic but snakes can somewhat be improved regarding their movement, especially the green snakes. I was considering another scene in Unity for a new mode but seeing how limited time combined with my limited ability, I doubt it would be done by the playtesting dateline. Coincidentally, a few playtesters mentioned something similar to this mode in question as well. By the conclusion of the testing, many aspects of the game that needed improvements and been pointed out. This is the major reason why playtesting was conducted. As well as seeing how much the playtesters enjoy the game in the prototype state; averaging the fun score results resulted 6.6/10. In my opinion, it didn’t do as bad I thought it would for a prototype. By going through the design process, I have learnt that professional development requires massive amount of consistent hard work and team work coordination as well as perfection level of time management. I learnt that the design process needs to be done step by step and when in a team, earlier parts of the workload has to be done before team can move on any further. This requires skillful communication between the members in the team to get the whole project completed on time. This ties in with consistency of hard work and commitment to doing them. “Quality over quantity” was a quote I heard from my previous tutor and I stick to it ever since. From all the knowledge I have learnt, there is a noticeable link between them all; without one aspect, the rest cannot be accomplished. As a major software technology and minor animation student, I have learnt that working in a mixed team of members being very skillful at one aspect is very useful in putting together a commendable game. I noticed that unless you did the major from year 1, things will be much harder to understand and proceed on. As team members, we exchange knowledge on what we have learnt so far from the our majors. Even if we are in the same major, we can still help each other out, there’s always something new to learn. As me personally, I rely on my team mates for quite a bit, when I don’t understand something or just getting them to catch me up to where they are up to. It is definitely from coding the core mechanics of the game prototype on my own that makes me feel satisfied the most. Especially the the hit box of the shovel and putting all the scripts and game objects together to make the game, it feels like completing a 1000 pieces jigsaw puzzle, maybe more. I need to mention that a team member have purchased some assets for the whole team to used without asking for a money pitch. If I knew beforehand, I would have insisted on paying some for it since I used the assets he bought as well. I was very pleased with creating the animation, even though its as simple as moving up and down, stimulating whacking movement. I feel that the knowledge from my minor in animation has helped in understanding the terms Unity used for their animation process (I’m currently using Blender for the animation unit). Although I got some help from the tutor on making the hit box of a melee weapon, I feel that I can still be proud because of what I have done after leaving the session at home, extending what the tutor has showed me and go further. The prototype can possibly be criticised for its ethical issues on animal cruelty; smashing snakes with a shovel, although the possibility is critically slim. My thought is that there isn’t any ethical issue attached to this First Person Experience inspired by recent events. I see the game as something not to be taken seriously in terms of reality. Otherwise it would be equivalent to saying saying Call of Duty multiplayer is wrong because people kill each other to see who comes on top. Most games were made for entertainment, but different players get different influence from playing. This FPS was made to played purely for fun. If someone was playing this game without knowing that it is inspired by a recent events, they would most likely never figure it out at all. Different objects within the game have different purposes and contribute to the game in different ways. The most relevant objects are listed in the table below including its purpose, relationship and interaction to another.